What would it be like to be the final living person on Earth, all alone, with no one to reach out to for comfort, help, affection, etc.? One on side, it could be an amazing experience having the expanse of the globe in which to operate with no one to bother you, oppress you, harass you. At the same time, it would be an existence on loneliness, with you never having a chance to see and feel another person. 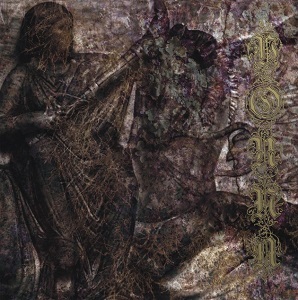 Vouna is the project of Yianna Bekris, who also has made her impact on other bands including Vradiazei, Eigenlicht, and Sadhaka and is delivering her self-titled debut album on Artemesia Records, the label run by members of Wolves in the Throne Room. That creative union makes a lot of sense, as Bekris’ music basks in the Pacific Northwest waters, though in a completely different way. There definitely are strains of black metal infused in the music, as well as funeral doom, shoegaze, and even 4AD-style murk rock, making for an atmospheric, dreamy ambiance that gets inside your bloodstream. On top of the storming melodies and chaos comes Bekris’ astonishing, emotion-rich singing that grabs your attention and refuses to let go on this artistic vision of someone becoming the world’s final living being. 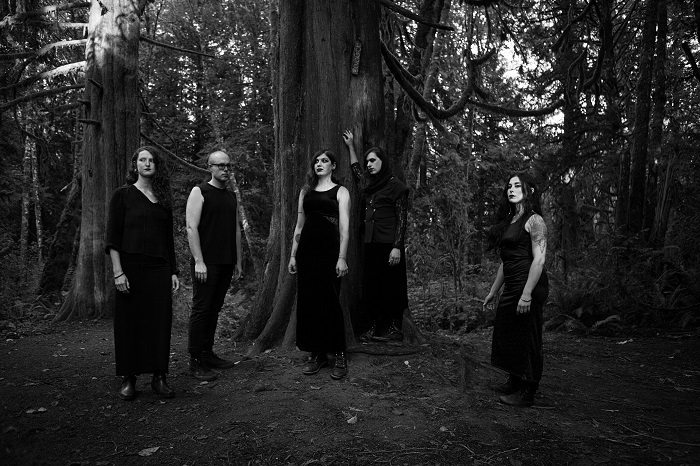 Over the course of these five songs, Bekris (while she handles all instrumentation and singing on the record, the full version of the band contains Lord Hoelzel on drums, Autumn Kassel on synth, Caitlin Fate on lead guitar, and Marrow handling bass and backing vocals) creates a document that’s a noteworthy new addition to extreme music, one that should be fascinating to follow into the future. “A Place to Rest” opens the record with Bekris singing a capella, “Rain on the ground,” as the song slowly comes to life as guitars charge, her singing soars, and a swarm of sound develops a foundation. Synth glaze is heavy, mixing with acoustics before fading out. “Cattle” starts dramatically as keys whir and guitars take off, leading to plucked strings adding more texture and a flood of synth hailing. The track is woodsy and emotional, calming for a stretch before fog wafts over, keys rise to the surface, and the track surrounds you like a swarm, leaving you with eternal buzz. “Last Dream” emerges from the unconscious state, as the vocals float ghostlike, with rustic acoustics and impassioned singing merging to form a greater whole. That leads into a mist of sounds, as guitars drip and stretch, pushing to its final destination. “Drowning City” is the second-longest track, clocking in at 7:06, with guitars chiming, Bekris’ voice echoing, and the track feeling like a folkish journey to take in your mind. Just then, the pace is shredded, as the song and all of its elements flood the scene, Bekris’ singing compels your heart to swell, and soft flutes breeze into the background like a draft in a dark room. Organs arrive and twist up in acoustics, with the singing rumbling in chests, keys raining down relentlessly, and a doomy and gothy final moments bringing shadows. Closer “You Took Me” runs 8:26 and is a highlight, the classic best-for-last trick, as the song bathes in mesmerizing keys and layers of ice before the guitars cut in. Bekris’ singing goes to new heights, even feeling a little bluesy during the verses, while the music gushes pain, and spacey synth frosts everything over. Dark synth pumps away, almost like a funeral march, while the track pounds in calculated fashion before disappearing mysteriously into mid-air. Likely none of us ever will have to experiencer utter solitude like we can imagine on Vouna’s stunning debut record, but this gives a look into that fantastical scene, where there’s no one left but you. The music on this record, and Bekris’ immense talent, make this a really noteworthy release, one that could be the start of a really special project. This is art that combines savagery and beauty in a way few others have dared, and it’s utterly breathtaking to behold.